The capacitor is one of the most essential parts of an air conditioner. It is a small device that stores energy in an electrostatic field. Capacitors are attached to the motors to stabilize voltage and provide the required jolt to start the motor. An air conditioner has three main motors- the compressor motor, the blower motor, and the outside fan motor. All three motors of an A/c have two separate capacitors attached to them. One is the start capacitor that starts it and other one is the run capacitor that keeps it running. A failing capacitors is an acute cause of malfunction of an air conditioner. In such case the A/c would stutter when powered on, trying to turn on and go off after a short time. However a faulty capacitor is not a big issue. If it is detected at the right time, it can be replaced without much cost. But in case it is ignored, it can affect the air conditioner generating a costly repair bill. How to detect a bad capacitor? The usual symptom of a bad capacitor is a hard starting air conditioner. Hard-starting can happened due to other reasons beside bad capacitor. But bad capacitor has been the most common cause of this. Capacitor problem cannot be detected by non-professionals. A technician would examine the capacitor to see if there is visible damage to it, such as splitting, bulging, or leaking oil. He will also run electrical tests to make certain. Even after the capacitor is not functioning, the motor would at till try to come on. This is cause of humming and stuttering and going off after a while. If the capacitor is not swapped in such situation, the motor would heat up due to the stress and burn out eventually. You should always watch out for potential symptoms of a failing capacitor. A faulty capacitor will begin to make a clicking noise. 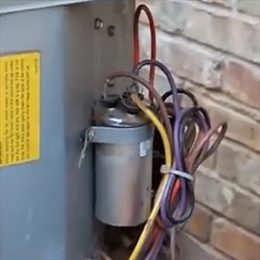 As for replacing the capacitor leave this to an expert HVAC technician. He would know the best design for your model and will be able to replace it without much effort and perfectly.